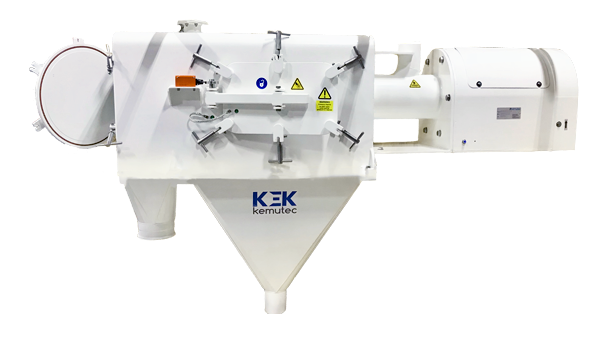 The Kek K800CP Cantilever Design Sifter features an easy clean, tool-free design allowing for maximum output and uptime. Its oversize hinged door provides quick access to the hygienically design sifting screens. The Kek Centrifugal Sifter is ideal for Food, Pharmaceutical, and Chemical Powder Processing Industries. Application: Designed to operate in standard conveying line, 10 psi. Special Features: Inline sifter for conveying system – hinged and interlock access doors for rapid screen check and cleaning. Equipped with heavy duty O-ring pressure seals on access doors.